What do you believe about yourself? When you make decisions throughout the day, are you choosing from the person you were or from the person you are becoming? Making a simple shift in your mind to embrace the person you desire to be can make all the difference. If you struggle with confusion and indecision, ask yourself, what would the me who has total clarity do? If you are wrestling with lack and scarcity mentality, ask yourself, how would I act if I knew I always had money for all of my wants and needs? If you struggle with a lack of confidence, ask yourself, what would my inner badass do? We can choose how we want to be – we can play the victim and continue playing small or we can choose to be empowered and powerful. The truth is we ARE powerful. We have just lost sight of it somewhere along the way. I have always been a lover of language and am recognizing more and more the power of the words we use. They create our identity and our world. Today (and every day). I encourage you to pay attention to how you talk about yourself (to yourself and to others). Choose to be the most powerful version of you. Talk about yourself that way, make decisions that way, act that way, and feel that way. It makes an incredible difference. If you’re ready to bring out the most powerful version of you, I have 2 spots open in my 1:1 90 day mentorship. This will give you the high-level support to break through your limiting beliefs, shift into a success mindset, take powerful actions that align with your desires, and will help you step into the most powerful version of you to increase your income, clarity, and confidence. That’s when everything changes. Curious? Book a call with me and let’s dig into what that looks like. I talk about mindset a lot. Why? Honestly? Because it is hard for me. I grew up with a bit of a pessimistic bent. Although I was a generally positive person, I was great at making myself feel awful – not smart enough, not thin enough, not fit enough, not pretty enough, not successful enough. The crazy thing about what we tell ourselves is that we start to believe it and even worse, we look for evidence that it’s true. The ol’ self-fulfilling prophecy. I started studying psychology in my teens as I sought to heal myself from an eating disorder. This was my first big realization of the power of our thoughts. It took me a long time to build myself back up and trust myself after so many years of abuse. I kept at it because I knew there had to be a better way than being a prisoner to my self-defeating thoughts. The next big realization occurred around relationships. I was still carrying around doubts about my self-worth, which led to a series of bad relationships. It took work to learn to love and honor myself and expect the same from a partner. Recognizing the power of our thoughts for both the good and the bad is eye opening. It behooves me to guard my thoughts and to engage in practices that augment my thought life. I can’t leave my mind to its own devices – Lord knows where I’d end up, but it wouldn’t be pretty. It’s not easy, though it is simple. For me, I believe I must do double-duty since I have such a long history of negative thinking. This means I have to engage in some form of mindset practice daily. What does that look like? I wish my default thought patterns were those of my inevitable success but until then, I will keep practicing. Why? I feel better when I think positive thoughts. I engage in conversations and in relationships from a place of wholeness, curiosity, and generosity. I take on new projects with interest and excitement about how they’ll turn out. I would much rather go through life like this vs. being the doom and gloom, the world is going to the toilet, everything is awful, might as well give up person. My mission in life is to help others create systems and structures that support their ultimate success – the best way for me to do that is to live that. It starts with your thoughts and with mastering your mindset. If I can do this, so can you. Have you given up or lost sight of your goals for this year already? Not sure how best to implement them? Do you want some help avoiding the pitfalls along the path to achieving your goals? Schedule your free Breakthrough Session to discuss your strategy for success. This meditation calls in your power by using repetitive powerful, positive affirmations. It helps retrain our brain to shift from a place of self-criticism to self-acceptance. Choose words that fill you up and raise your vibration, starting each sentence with ‘I am,’ and repeat until the timer sounds. If you run out of words, start over with the words you began with and repeat. Once the timer sounds, take a deep inhalation, hold for a count of three, slowly exhale, and hold out for a count of three. Rub your hands together in front of your heart center. Give gratitude for this meditation and to yourself for showing up. Examples of words you could use for the meditation: Love, Peace, Light, Truth, Abundance, Passion, Joy, Purpose, God, Power, Inspiration, Motivation, Health, Wealth, Happiness, Prosperous, Energetic, Inspired, Powerful, Unstoppable, Spiritual, Blissful, Beautiful, Bountiful. You can use adjectives or nouns or both. Simply state, ‘I am…’ and fill in the blank with what you desire to draw into your life as well as who you desire to be. I am powerful. I am passionate. I am peaceful. I am power. I am passion. I am peace. I am love. I am energy. I am healthy. I am happy. I am wealthy. I am prosperous. I am abundant. I am purposeful. I am prosperity. I am energetic. I am limitless. Keep going. You can keep adding new words or repeat the words that resonate with you the most. The key is to use powerful, positive affirmations. This is who you really are and you are claiming it. Notice how you feel afterward. Notice how you feel throughout the day. Notice if anything feels different. Congratulate yourself for completing the meditation and for prioritizing your mental and spiritual health and your mindset. Remember, you become what you believe so choose to believe what supports you in being the highest version of you. What are your magical powers? What are you magical powers? We all have a bit of magic in us. Sometimes we hide it, even from ourselves. Many of us believed in magic when we were kids. We were open to seeing things differently and exploring was our true nature. We were creative, imaginative and had boundless energy. As we grew up, somehow with maturity came a loss of our child-like wonder, our ability to see the whole world as a bit magical. All of that is not lost. We still have that within us. It’s about altering our perspective, and not only on how we view the world, but also how we view ourselves. We were all born with innate gifts and perhaps because they come so easily to us, we forget about them. Do you have eyes that speak volumes? Do you offer comfort that allows people to melt into you? Does your sense of humor lighten up people’s days? Do you listen to someone as if they are the only person in the entire world speaking? Does your kindness melt even the coldest of souls? Do your pictures tell a story beyond the photograph? Do your class lessons transport your students to another world? Can you sell water to a fish? Do your dance moves inspire people to move their bodies? Do you make numbers tell a story? Does your code make websites come alive? Does your food feed people’s souls? Does your writing feed people’s imaginations? Does your art elevate people’s spirits? Do your organizational skills free up time and space? Do you make cars, trains, planes, and other machinery run smoothly and effortlessly? Do your debating skills allow people to see things from a different perspective? Do you transform people’s smiles? Do you illuminate people’s genius? Do you heal the sick? Do you mend the broken-hearted? The list of magical abilities goes on and on and on. All we have to do is claim them as ours. 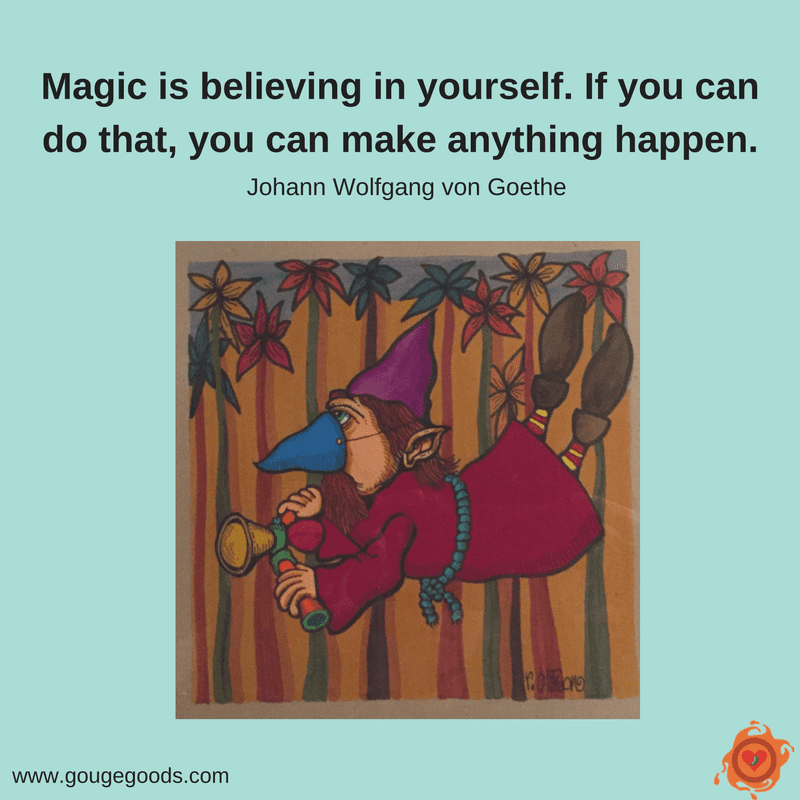 So, I’ll end as I began – what are your magical powers? Claim them. Own them. Celebrate them. Share them.